The current "Group Show" at Kathryn Markel Fine Arts in Bridgehampton offers a look at multi-faceted approaches to abstraction and non-figurative disciplines by artists in the gallery’s stable. The exhibition displays distinctive, strong work while revealing intriguing directions, mediums and techniques that are shaping the evolution of contemporary art. A prime example of this kind of innovation is Debra Smith, who at one point lived and worked in Brooklyn but later returned to her birthplace of Kansas City. Smith creates entertainingly airy abstract images using vintage fabrics she pieces together. This technique conjures a striking effect that is highly painterly, yet imbued with a sense of physicality from the materials that gives the works an almost sculptural sensibility as well. The effect is particularly notable in Making Visible #4 (pieced vintage silk, 2012) which uses powerful contrasts in composition in its interaction of horizontal and vertical elements, while the grey ground provides a gentle bed over which the assertive red geometric elements seem to float in an airless void. "Making Visible #4" by Debra Smith, 2012. Pieced vintage silk, 25 x 19 inches. Courtesy Kathryn Markel Fine Arts. A similar sensibility is apparent in Justine Hill’s Under One’s Own Steam (acrylic and pastel on canvas, 2013) although the interaction of forms is distinctly less mellifluous and more frenetically emphasized. At the same time, though, the artist’s use of assertive coloration and aggressively energetic brush strokes nevertheless creates harmonically rhythmic entities that gain in power from the softer background, which serves to stabilize the composition. "Under One's Own Steam II" by Justine Hill, 2013. Acrylic and pastel on canvas, 54 x 44 inches. Courtesy Kathryn Markel Fine Arts. Diane Ayott, by contrast, attempts to erase any distinction between foreground and background, thereby creating an orchestrated relationship in which her use of color and geometric forms interacts with viewers and constantly draws attention from the surface deep into the structure of the work and then seamlessly back again. This kind of interaction arises from the artist’s understanding of how to manipulate the imagery so that each layer that is applied develops its own conversational relationship with the stratum below, and the result is a deceptively subtle spatial density. This kind of density is particularly apparent in Cherries (mixed media on paper, 2009) and Lost Again (mixed media on paper, 2009), while in Means and Ends (mixed media on canvas, 2013), Ayott uses playful accents of color reminiscent of techniques usually associated with Aboriginal dot motifs. "Means and Ends" by Diane Ayott, 2013. Mixed media on panel, 38 x 38 inches. Courtesy Kathryn Markel Fine Arts. Interestingly, despite the gallery’s stated preference for abstract and non-objective work, a few of the artists exhibited actually lean on representational imagery before taking the work in interesting directions away from mere figuration. This is exceptionally notable in Anne Wildey’s Ocean 5129 (oil on linen, 2013), Peter Hoffer’s Landscape with Foliage III (oil, acrylic, and resin on panel, 2013), and Sara McCulloch’s Summer Fields from Car (oil on canvas, 2008). "Ocean 5129" by Annie Wildey, 2013. Oil on linen, 36 x 48 inches. Courtesy Kathryn Markel Fine Arts. "Landscape with Foliage III" by Peter Hoffer, 2013. Oil, acrylic, and resin on panel, 22 x 60 inches. Courtesy Kathryn Markel Fine Arts. "Summer Fields From Car" by Sara MacCulloch, 2008. Oil on canvas, 20 x 20 inches. Courtesy Kathryn Markel Fine Arts. In much the same way, the structural ambiance of Stephanie London’s Mid-Century Rose (oil on linen, 2014) would seem to owe almost as much to Joseph Alber’s Homage to the Square series as it does to traditional horticultural painting. "Mid-Century Rose" by Stephanie London, 2014.Oil on linen, 12 x 12 inches. Courtesy Kathryn Markel Fine Arts. Also featured in the exhibition, which runs through June 21, are works by Yolanda Sanchez, Kim Uchiyama, Marilla Palmer, Mary Didoardo, Paul Behnke, Josette Urso and Meredith Pardue. "Radio Wave" by Josette Urso, 2014. Oil on canvas, 36 x 48 inches. Courtesy Kathryn Markel Fine Arts. BASIC FACTS: "Group Show" remains on view through June 21, 2014. 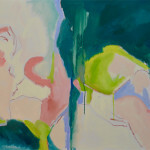 Kathryn Markel Fine Arts is located at 2418 Montauk Highway, Bridgehampton, NY 11932. www.markelfinearts.com. I’ll definitely follow his example. Improve for the better.